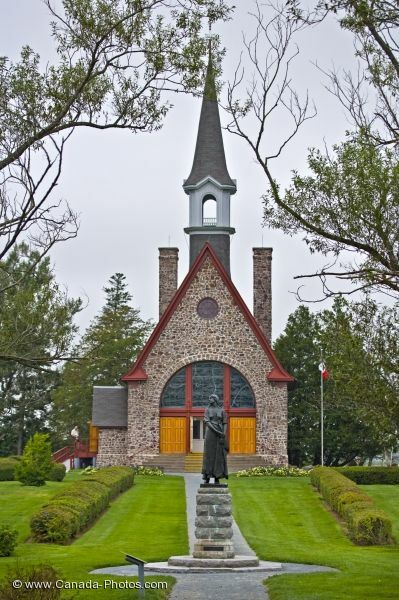 A beautiful historic Memorial Church on the grounds at the Grand Pre National Historic Site in the Bay of Fundy in Nova Scotia, Canada with the Statue of Evangeline on display outside. The current Memorial Church at the Grand Pre National Historic Site in the Bay of Fundy in Nova Scotia was built on the site of the ruins of the Acadian Church of Saint Charles-des-Mines. It was established in 1687 and was thought to be destroyed during the deportation in 1755. The bronze statue of Evangeline stands in the center of the path outside this historic place of interest. Church, built in the 1920's, at the Grand Pre National Historic Site, Grand Pre, Minas Basin, Bay of Fundy, Nova Scotia, Canada. Photo of the statue of Evangeline outside the historic Memorial Church in the Bay of Fundy in Nova Scotia.